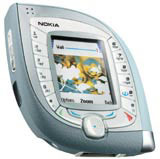 Nokia launches its latest mobile phone this week, the 7600, together with a range of Imagewear, as the manufacturer moves to broaden its digital offering in anticipation of 3G growth. The 7600 is billed as a ‘tool for visual communication’. It incorporates a camera, MP3 player, 65 000-colour screen and has videostreaming and multimedia messaging capacity. Nokia senior designer Tej Chauhan says the ‘futuristic’ product incorporates interchangeable sleeves, and the Imagewear range includes among other things a kaleidoscope and necklace-style ‘medallions’, which enable users to digitally download and store pictures that are then displayed on the pendant. The 7600 will be available at The Conran Shop from November, with wider distribution to follow by December.